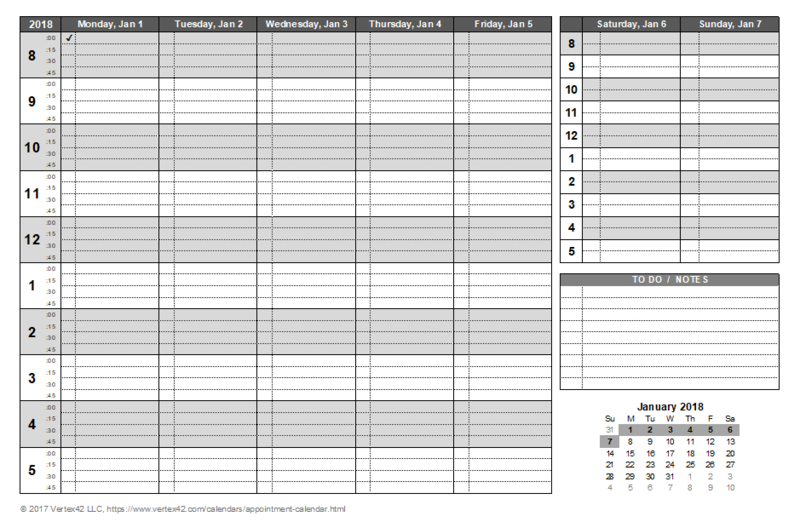 We've created two different weekly appointment calendar templates that you can use to print your own appointment books. Both templates include mini monthly calendars in the lower right with the current week highlighted. You can choose the start day and the start hour. 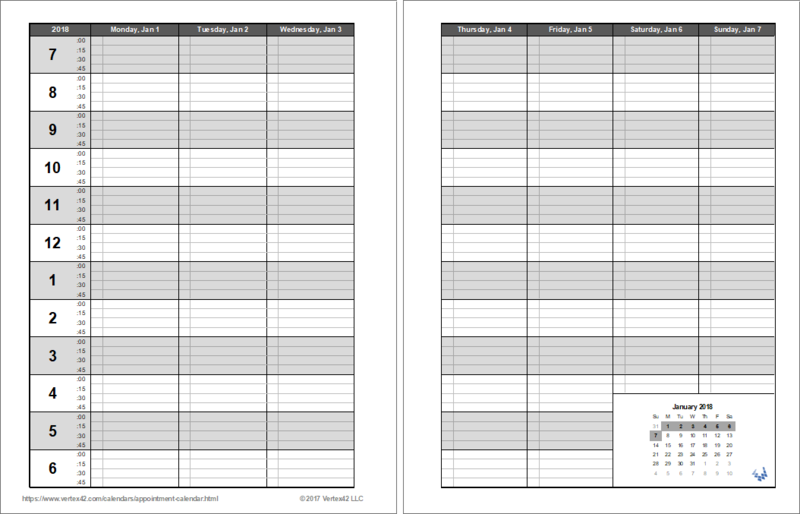 The Weekly Appointment Calendar prints on a single page, and the Appointment Book template prints a week across two pages and is designed for double-sided printing. This weekly appointment calendar can be printed on a single sheet of paper in landscape orientation. You can print a single page at a time, changing the start date at the top. This version was designed to allow you to customize the worksheet prior to printing. Then, if you want to print multiple weeks at a time, you will need to duplicate the worksheet and use a formula to calculate the start date for each worksheet (such as =previous_start_date+7). After duplicating the worksheet, you can hide the (c) worksheet and then choose the Print Entire Workbook option from the print settings. This template was designed for printing a blank appointment book using the duplex mode on your printer to print double-sided. You can then either bind the pages together to make a book or use a whole-punch and place the pages into a 3-ring binder. You can print up to 54 weeks at a time, but I would recommend that you first make sure your print settings are correct by printing only the first few pages. The template allows you to change the start date and the start hour. If you want your week to start on a Monday, make sure that your start date is a Monday. 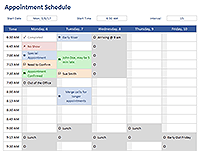 One of the most handy features of this appointment book is the mini-calendar in the lower right of the page that allows you to quickly find the month and week you need when scheduling a future appointment.